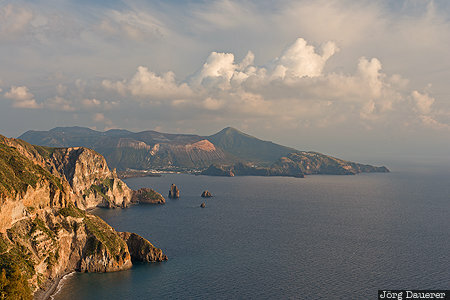 The rocky coast of Lipari and the island Vulcano in the background seen from Belvedere Quattrocchi. Lipari part of the volcanic archipelago of the Aeolian Islands north of Sicily, Italy. This photo was taken in the evening of a sunny day in March of 2017. This photo was the image of the month in October of 2017. This photo is in the Photo Calendar "Sizilien". This photo was taken with a digital camera.